Synchronizing user entries is configured with the synchronization agreement. However, passwords in both Active Directory and Identity Management are not part of the normal user synchronization process. A separate client must be installed on the Active Directory servers to capture passwords as user accounts are created or passwords are changed, and then to forward that password information with the synchronized updates. The Password Synchronization client captures password changes and then synchronizes them between Active Directory and IdM. This means that it synchronizes new passwords or password updates. Existing passwords, which are stored in a hashed form in both IdM and Active Directory, cannot be decrypted or synchronized when the Password Synchronization client is installed, so existing passwords are not synchronized. User passwords must be changed to initiate synchronization between the peer servers. Active Directory must be running in SSL. Install the Microsoft Certificate System in Enterprise Root Mode. Active Directory will then automatically enroll to retrieve its SSL server certificate. The Password Synchronization Service must be installed on each Active Directory domain controller. 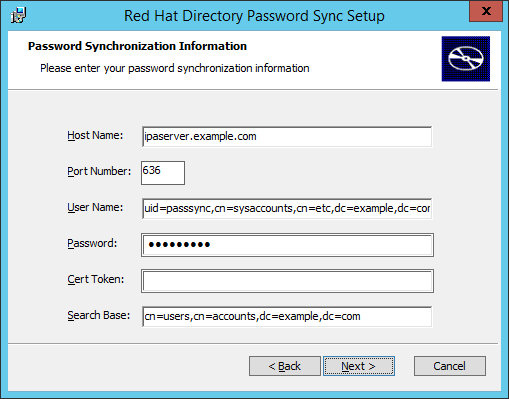 To synchronize a password from Windows, the PassSync service requires access to the unencrypted password to synchronize it over a secure connection to IdM. Because users can change their passwords on every domain controller, the installation of the PassSync service on each domain controller is necessary. The password policy must be set similar on IdM and Active Directory side. When the synchronization destination receives an updated password, it was only validated to match the policy on the source. It is not re-validated on the synchronization destination. If the value of the attribute pwdProperties is set to 1, the password complexity policy is enabled for the domain. If you are unsure if group policies define deviating password settings for Organizational Units (ou), ask your group policy administrator. Run gpmc.msc from the command line. Open Forest: ad.example.com → Domains → ad.example.com. Right-click the Default Domain Policy entry and select Edit. The Group Policy Management Editor opens automatically. Open Computer Configuration → Policies → Windows Settings → Security Settings → Account Policies → Password Policy. Enable the Password must meet complexity requirements option and save. Install the Password Synchronization Service on every domain controller in the Active Directory domain in order to synchronize Windows passwords. Log in to the Customer Portal. Select Red Hat Enterprise Linux from the product list. Select the most recent version of Red Hat Enterprise Linux 6 or Red Hat Enterprise Linux 7 and architecture. Download WinSync Installer for the architecture of the Active Directory domain controller by clicking the Download Now button. Double-click the MSI file to install it. The Password Synchronrization Setup window appears. Hit Next to begin installing. Fill in the information to establish the connection to the IdM server. The IdM server connection information, including the host name and secure port number. The user name of the system user which Active Directory uses to connect to the IdM machine. This account is configured automatically when synchronization is configured on the IdM server. The default account is uid=passsync,cn=sysaccounts,cn=etc,dc=example,dc=com. The password set in the --passsync option when the synchronization agreement was created. The search base for the people subtree on the IdM server. The Active Directory server connects to the IdM server similar to an ldapsearch or replication operation, so it has to know where in the IdM subtree to look for user accounts. The user subtree is cn=users,cn=accounts,dc=example,dc=com. The certificate token is not used at this time, so that field should be left blank. Hit Next, then Finish to install Password Synchronization. Import the IdM server's CA certificate into the PassSync certificate store. Download the IdM server's CA certificate from http://ipa.example.com/ipa/config/ca.crt. Copy the IdM CA certificate to the Active Directory server. cd "C:\Program Files\Red Hat Directory Password Synchronization"
Reboot the Windows machine to start Password Synchronization. The Windows machine must be rebooted. Without the rebooting, PasswordHook.dll is not enabled, and password synchronization will not function. If passwords for existing accounts should be synchronized, reset the user passwords. The first attempt to synchronize passwords, which happened when the Password Synchronization application is installed, will always fail because of the SSL connection between the Directory Server and Active Directory synchronization peers. The tools to create the certificate and key databases is installed with the .msi. The password synchronization client cannot synchronize passwords for members of the IdM admin group. This is an intended behavior to prevent, for example, password synchronization agents or low level user administrators to change passwords of top level administrators. Passwords are only validated on the synchronization source to match the password policies. To verify and enable the Active Directory password complexity policy, see Section 6.6.1, “Setting up the Windows Server for Password Synchronization”.